Sometimes the item is so great that cost isn't a factor. Learning Resources offers an amazing letter construction set that is perfect for workbox use! What makes it better than other letter construction sets? Well, the pieces snap together easily so that when your child puts them together, they stay together. And step-by-step instruction cards tell you exactly what pieces are needed and how to snap them together to make the letter. Both capital and lower case letters are demonstrated. The set retails for $40.00 on amazon, but I watched for deals and got it for half that during the summer. Materials Needed: Everything is in the box! Work for Teacher: Hey, it can't get any easier than this! 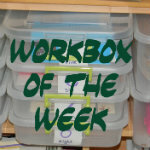 Check out my other posts about workboxes by clicking HERE!